It’s September 20, and the furnace is on now for the winter. We’re back to wool socks and long johns. Time to get the garden turned over and put to bed for the winter. I love eating outside on nice days in the cool autumn air. 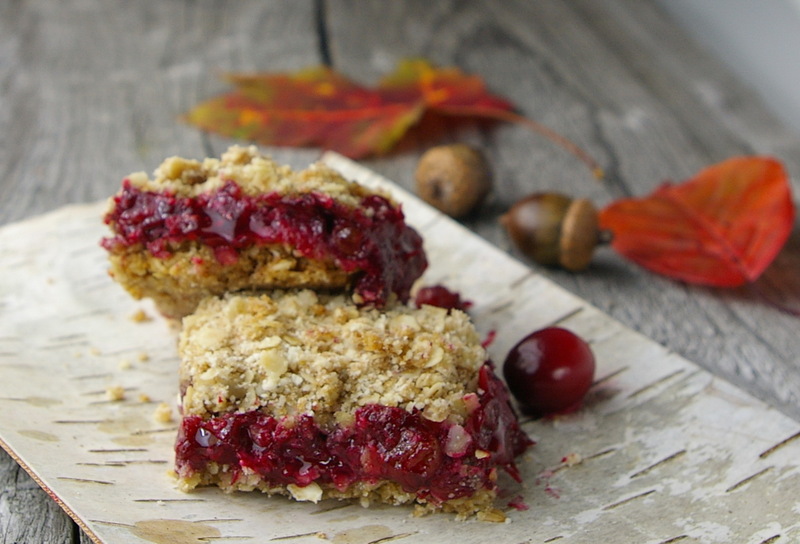 It’s so refreshing, and these Cranberry Oat Squares are just the ticket for a nice little afternoon treat after working in the garden. I love the bright color of cranberries. It’s a good idea to keep a few bags in the freezer, so you can whip up a batch of these little squares in a moments notice. In a medium size pot, on medium heat , cook cranberries with the granulated sugar until soft, stirring often. You can use frozen or fresh cranberries. Mash the cranberries with a potato masher, and continue cooking for another 5 minutes . Add the raisins, and stir for another 1 or 2 minutes. Mix the cornstarch with cold water , and add to the mixture , stirring until thickened. Remove from heat and let cool. Sift the flour, baking soda and salt into a large bowl. Cut the butter into the flour mix with a pastry cutter, or a couple of knives will do the trick . The mix should have small lumps about the size of peas. Mix in the brown sugar and oatmeal. Spray the bottom and sides of a 9 inch(23cm) square cake pan with spray cooking oil, and sprinkle with a little dash of flour to dust the pan. Spread half of the batter onto the pan, and press down evenly. 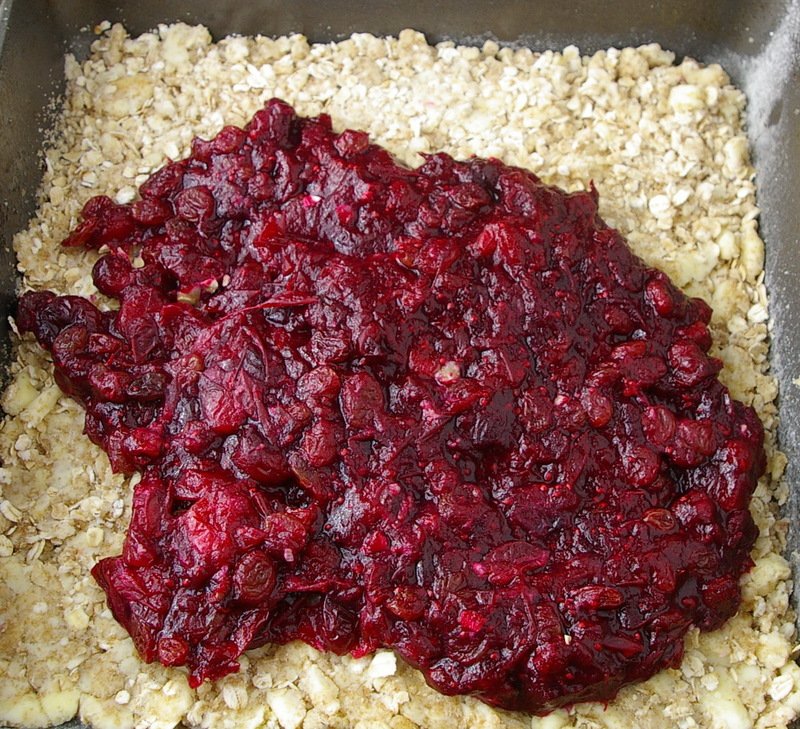 Spread evenly with the cranberry purée , and then top with the remaining oat mix. Press lightly . Bake for 30 minutes, or until lightly browned on top. Remove from oven and let cool. Goes well with some homemade vanilla ice cream . * Note : This recipe originally called for white sugar, and brown sugar, however, I have tried other sweeteners such as Splenda and the Splenda brown sugar blend to accommodate diabetic diets, and as a healthier version I have also tried with granulated sugar cane . There are some good all natural sugars out there now, that have more nutrient value than refined white or brown sugar. It is up to the individual what you prefer to use. This entry was posted in Home and tagged Bake, bars, Brown sugar, Cranberry, dessert, raisins, Splenda, squares, Sugar by Ginger Smoothy and Otto Pilot. Bookmark the permalink. How did your garden make out this summer ? Did you end up with a bumper crop ? I saw your post for the mildew spray and I’m going to try it next year on my bergamot , I grew some for tea this year.